It was the definition here – for BIGHAS – that I liked. BIGHA is defined in Chambers as having quite a wide range of different areas. The smallest of them is one third of an acre, so BIGHAS – i.e. presumably at least two of them – must be at least two-thirds of an acre. Delightful. In the one cell that featured the George’s Bush, both 41 and 43 had to be ‘entered in thematic order’. In practice that only appears to require a comma after the 41 to indicate their order – I hope I am not missing something here! And the Title? Quiet Guests = P + RESIDENTS. Now if only I had spotted that before finishing the whole puzzle. D’oh! Grid; Theme; PDM; Gimmick; Clues; Fun. Do any of you already do similar? If yes, I’d be grateful if you’d share with me via the Comments on this site. Two or three of us compared notes at The Magpie party (many thanks Mark and friends!) very recently and were using very similar. Thanks to Artix for suggesting the last one – I had been using ‘Overall’ – but that’s far more direct and Fun was exactly what I meant! I’m not yet brave enough to share my marks per puzzle here – perhaps I’ll start later in the year once it’s clearer that these dimensions are working! The last puzzle of 2017 was very gentle fare from Jago. Would the first of 2018 likely to be the same? Unlikely I thought, being from the mighty pen of Schadenfreude. It was exactly a year (well, 364 days) since his last puzzle based on the logo and motto of The Times newspaper, “Honi soit…” etc. This week saw his 25th Listener, the first being way back in 1998, with its theme of Arnold Bennett’s Five Towns based on Stoke-on-Trent. Here we had some cells being “crowded” with more than one letter. (Was this going to be based on another busy metropolis?) Entries without any such crowding would lead us to what would need to replace these scrunched words. Progress on this puzzle was fairly slow, despite getting off the mark with 12ac ENCALMS which was two letters too long for its entry. If I had managed to get 13dn ADAMITE for Naturist worried about Dutch friend (5) the theme might have come together much more quickly, although I might well have wondered if we were dealing with Joy Adams, with Attenborough, Bellamy, etc to follow. It was, in fact, well over an hour into this puzzle before I got 10dn Rope in leader of gang no longer gambling (4) giving JEFFING. I then saw the possibility of JEFFERSON and, with half of HARRISON and JOHNSON elsewhere in the grid, the theme of US Presidents became apparent. 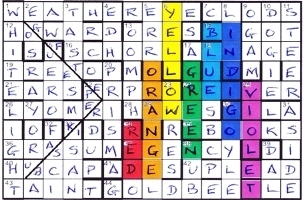 Meanwhile, the message spelt out by the initial letters of the non-scrunched entries added to the initial letters of their clues seemed to be spelling out sequence together with incumbent or numerical order. Thanks, Schadenfreude. Not particularly gentle fare, but good fun and a great start to the year. Anyway — I then resolved, once I was more alert the next day, to try to develop a puzzle on the theme of the colours of the spectrum (but not just about the rainbow, I might add!). And so I hit upon the idea of using diagonally-spilt squares to use as “focal lines” for my light source onto my “prism”. It so happens that I am a particular devotee of the 15 x 10 grid: I came across it in the late 60’s or early 70’s, when it was used quite a bit by (I think) Jeffec or ffancy — but in any event, I have used that format for about a third of my Listener puzzles over the years. And of course, the letter-count is pretty much the same as with a standard 12 x 12 grid: 150 letters as opposed to 144: thus not so different a challenge — but its merit is that it allows (literally) greater “width” in the grid; and also, 15-letter words, if you are that way inclined, too! I soon discovered that the consecutive words “white” and “light” added up to 10 letters; which seemed the perfect start to the left-hand side of the grid. And then my split diagonal “focal lines” led naturally to a point about a third of the way in, where I then could place the “prism” which would “split” my “light beam” into its component colours. At first, I simply sought to enter the colours as words in their own right; but I soon realised that that was far too simple and straightforward: and so I hit upon the idea of hiding them amongst “normal” words. And with seven spectrum colours, plus my “white light”, my “focal lines” and my “prism”, I soon needed the additional grid-width that the 15-square grid gave me. The grid filled fairly readily; but I was forced to use a number of quite short words, in order to retain the grid’s symmetry, whilst also being constrained by the necessity of the entire theme. (I haven’t always used symmetrical grids: but I try to avoid giving them up, if at all possible.) I found “indigo” and “violet” quite hard to divide logically and artfully between pairs of other words; and that probably led to the use of a couple of 3-letter words in the grid. 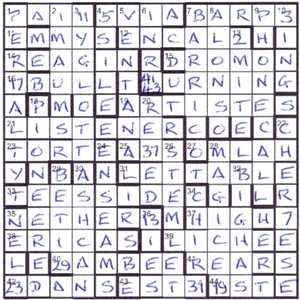 Once I had finished the grid (and the clues! ), I needed a title: and I toyed with “Spectrum” (too obvious) and “Newton’s Discovery” (too clumsy) and a couple of other more leaden efforts. Then I remembered a phrase from my childhood years, which referred (possibly sarcastically) to someone who was always bright and chirpy and never let things get them down: “A little Ray of Sunshine”. That seemed to me the perfect way to mislead solvers into thinking of enthusiasm or bright spirits; whilst being literally true to the origin of Newton’s discovery of the visible spectrum and its colours. You decide! Then came the submission and the (long, long) wait: almost 2 years from creation to publication. But I was delighted to have it as the final puzzle of 2017: and without any serious editorial changes — apart from a few tweaks to a few clues. (Aren’t there always? Or am I just deluding myself?) One proposed change that I successfully reversed was with the up-word “lad” — where I argued to keep the word “erect” in the clue (they wanted “upright”); but that conflicted with my wordplay about the sexual undertone of a young lad “fancying” anything with a pulse: and of course, “lad” when erect is “dal” — which is a variety of pulse, in its other use. I always like to inject a bit of humour into some of my clues (I hope you’ve noticed!) and indeed, I try not to take the whole world of crosswords too seriously, at any time. Here we had a grid where some cells needed to accommodate two letters with a diagonal line separating them. It turned out that there weren’t as many of these as I had expected… only eight. 1dn 26dn and 20 were unclued thematic entries referred to in the preamble. Once these were revealed as WHITE LIGHT and PRISM, it didn’t take long to spot the colours of the rainbow in seven columns to the right of the prism. I seem to remember some time back being in a quandary over exactly what colours to use. Blue and Indigo have always confused me, and don’t mention Purple, Violet and Mauve! Anyway, I think that JEG is fairly tolerant when it comes to that sort of thing. This turned out to be a very gentle solve for the last Listener of the year. Forty minutes saw everything fall into place. Thanks, Jago.